Pioneer Electronics has just launched two 30 second TV commercials featuring the High Definition PureVision (TM) Plasma Television in test mode. The voiceover is the same in both: “With unmatched technology and innovation years ahead of its time, we’ve pushed the boundaries of high definition and tested the limits of reality. The new PureVision Plasma Display. Only from Pioneer”. The ads invite viewers to the web site, pioneerpurevision.com. 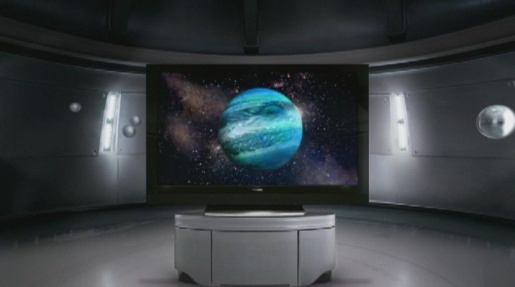 When the TV displays the image of a planet, numerous chrome balls get pulled into the planet’s gravitational force, fly up and move into orbit. 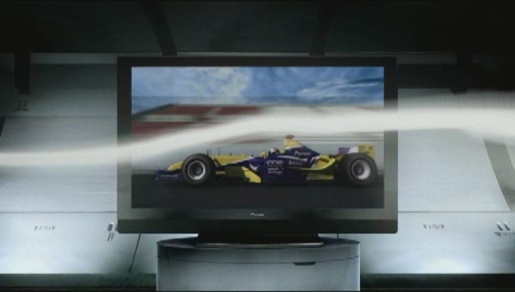 Imagery of a Formula 1 car on the TV appears so real that smoke flows around the racing automobile – instead of flowing around the TV itself. The Pioneer Testing Facility campaign was developed at Rubin Postaer and Associates (RPA), Santa Monica, by creative directors Joe Baratelli and David Smith, copywriter Seth Prandini, art director Hobart Birmingham, and executive producer Gary Patifocoff. Production, VFX and animation was all done at A52, directed by Andy Hall, with executive producer Mark Tobin, producer Sarah Haynes, visual effects/3D supervisor Andy Hall, Inferno artist Patrick Murphy, Shake artists Mike Adkisson and James Pastorius, pre-visualization artist Casey Schatz, and CGI artists Max Ulichney, Chris Janney, Kirk Shintani, Kevin Clarke. Sound was designed at 740 Sound Design, Santa Monica.